There is an index and transcription of the 1861 census now available on the Wendy PARKINSON web site. You can also perform a more selective search for churches in the Boothby Graffoe area or see them printed on a map. The first known church here was blown down by a hurricane in the year of the Great London Fire. The second was torn down in 1842 and the third church erected that same year. The existing church is built of stone. The church seats about 130. Richard CROFT has a photograph of St.Andrew's Church on Geo-graph, taken in January, 2006. The Lincolnshire Archives have the parish register from 1720. 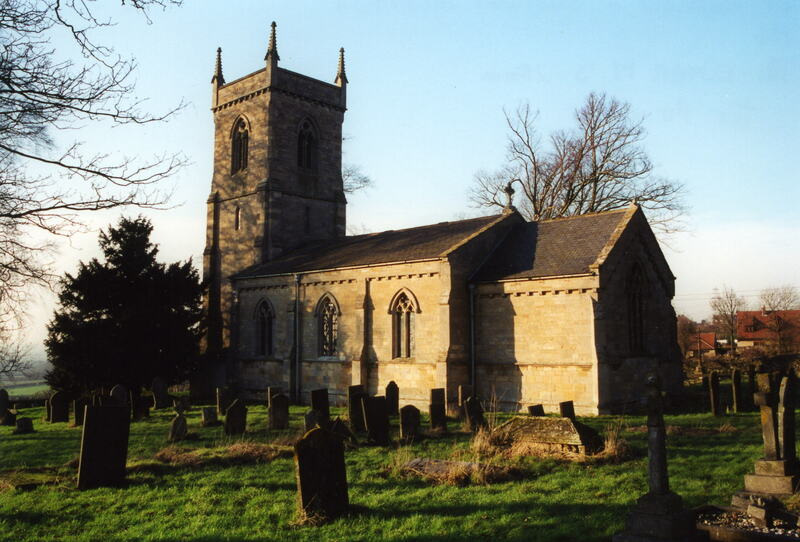 This village and parish lie 8 miles south of Lincoln and between Coleby and Navenby. Aubourn parish is to the northwest and Metheringham parish to the east. The parish covers just over 2,000 acres. Take the A15 trunk road south out of Lincoln and turn off at the B1202 road. Take that west to Boothby Graffoe village, just across the A607 trunk road. Matthew SMITH provides a photograph of the Main Street on Geo-graph, taken in October, 2005. Ask for a calculation of the distance from Boothby Graffoe to another place. You can see the administrative areas in which Boothby Graffoe has been placed at times in the past. Select one to see a link to a map of that particular area. Anthony BEKE, Bishop of Durham, obtained a license from Edward I to crenellate his mansion at "Saubretonne" or "Somerton" in this parish. Portions of this structure remain. It is locally known as Somerton Castle. Boothby Hall was the seat of Charles Edward MARFLEET. It was erected in 1867, built of stone. The national grid reference is SK 9859. You'll want an Ordnance Survey "Explorer #272" map, which has 2.5 inches to the mile scale. You can get a map of the Village Conservation Area in Portable Document File format (requires Adobe Reader) from the North Kesteven District Council. For a photograph of the Boothby Graffoe War Memorial and the names inscribed on it, see the Roll of Honour site. The parish was in the ancient Graffoe Wapentake in the North Kesteven division of the county, in the parts of Kesteven. The Common Lands were enclosed here in 1774. A National School was built here in 1851 to hold up to 50 children. Average attendance was about half that number.